The UNIVAC I (UNIVersal Automatic Computer), released in 1951 by Remington Rand, was the first US produced "commercial" computer. Remington Rand then became Sperry Rand and eventually Unisys. The UNIVAC I picture to the left is an actual photo from the Franklin Life Insurance Company. The UNIVAC I illustration in green above is from a Remington Rand advertising piece. The UNIVAC I was the first American computer designed for "business" use with fast execution of relatively simple arithmetic and data operations, as opposed to the complex calculations required of scientific computers. The UNIVAC was designed by the inventors of the ENIAC. The ENIAC was a one of a kind, fully electronic, digital computer developed during WW II at the University of Pennsylvania for the US Army. It weighed 27 tons and was delivered in 1945. It was used by the US Government to do the calculations for the first ever hydrogen bomb. 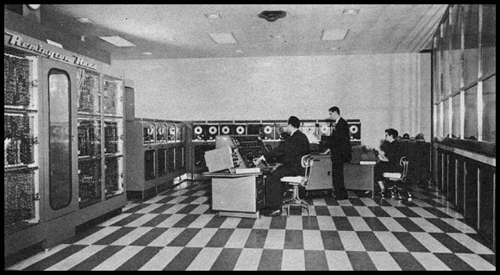 The first Univac was accepted by the US Census Bureau in March, 1951. A total of 46 UNIVAC I systems were built and delivered. It weighed 13 tons, ran at 2.25 MHz, and could perform 1,905 instructions per second. The UNIVAC I, after the first few installations, cost between $1.25 and $1.5 million per system. The UNIVAC I memory used "delay line tank" technology, pictured to the left. 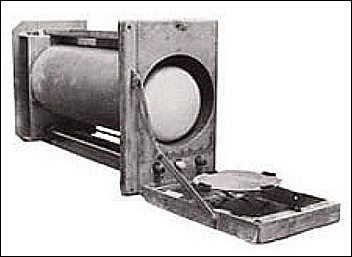 Sound waves were sent through a tube of mercury, detected, and returned through the tube. A memory tank for the UNIVAC I had 18 tubes, each holding ten 12-character words that could be accessed in approximately 222 microseconds. With ten tanks per computer, the total memory (including memory registers) in modern units was 1,800 words of 12 characters. When the words represented numbers, they were written as 11 decimal digits plus a sign. The UNISERVO tape drive was the primary input/output device on the UNIVAC I computer. It was the first tape drive for a commercially sold computer. See the row of UNISERVOs to the left below. The UNISERVO used "metal tape" which was a half inch wide thin strip of nickel plated phosphor bronze (called Vicalloy) 1200 feet long. The metal tape reels were very heavy. Data was recorded in eight bits on the tape (six for the data, one parity bit for error checking, and one timing bit) at a density of 128 bits per inch. The tape could be moved at 100 inches per second, giving the drive a transfer rate of 12,800 characters per second. To promote sales, Remington Rand joined with CBS to have a UNIVAC I predict the results of the 1952 Presidential election live on TV. With a sample of just "one percent of the voting population" it famously predicted an Eisenhower landslide while conventional wisdom favored a Stevenson landslide (the favorite of the pollsters). 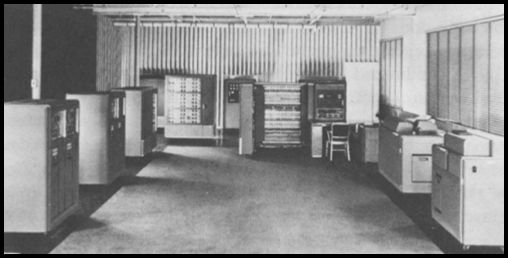 The IBM 701 (pictured to the left) was formally unveiled to the public on April 7, 1953 as the IBM 701 Electronic Data Processing Machine (701 EDPM at the time). IBM President Thomas J. Watson, Jr., had informed the company's stockholders at their annual meeting that IBM was building "the most advanced, most flexible high-speed computer in the world". 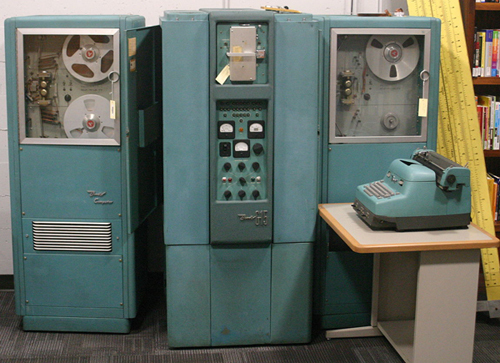 In the early 1950s the IBM 701 competed with Remington Rand's UNIVAC in a scientific competition conducted by the National Security Agency (NSA). The announcement was held secret until permission to market the 701 was obtained in 1953. The UNIVAC machines had less computational power than the IBM 701 for scientific computing. At the Lawrence Livermore National Laboratory, an IBM 701 meant that scientists could run nuclear explosive computations faster. However, UNIVAC had faster input-output (I/O) with their metallic tape drives and was favored when I/O was important. Before production began, Tom Watson Jr. visited with 20 companies that were potential 701 customers. This is what he said at the stockholders' announcement meeting mentioned above, "as a result of our trip, on which we expected to get orders for five machines, we came home with orders for 18". 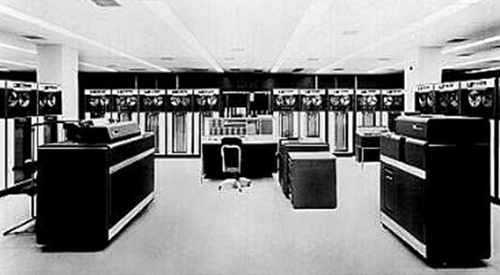 Nineteen IBM 701 systems were eventually installed. The first 701 was delivered to IBM's world headquarters in New York. Eight went to aircraft companies. The American Aviation Magazine of November, 1953 said the 701 rented for "$15,000 a month per 40-hour shift. A second 40-hour shift ups the rental to $20,000 a month." The system used vacuum tube logic circuitry and electrostatic storage, consisting of 72 "Williams tubes" with a capacity of 1024 bits each, giving a total memory of 2048 words of 36 bits each. Each of the 72 Williams tubes was 3 inches in diameter. Memory could be expanded up to a maximum of 4096 words of 36 bits by the addition of a second set of 72 Williams tubes. Williams Tube Memory. Freddie Williams, head of the Electrical Engineering Department at the University of Manchester in the UK, applied for a patent on his cathode-ray tube (CRT) memory storing device in December, 1946. The device became known as the Williams tube, or more appropriately, the Williams-Kilburn tube as Tom Kilburn helped Freddie Williams finish the working product in 1947. The Williams tube was the first practical form of random-access memory. By scanning the tube's surface area it was possible to store multiple data bits and to rapidly read them. A system of continuously reading and re-writing was required to preserve the data. The whole assembly had to be very well screened to prevent external interference. The technology was first incorporated in the Manchester Mark 1 computer in 1948. A single Williams tube could typically store 5,110 bits or 730 7-bit characters. Multiple tubes were used to make up the main memory. Williams tubes were used in both the IBM 701 and 702 memory units. Magnetic Tapes. IBM's magnetic tape patent holder and principal figure in developing the magnetic tape, Byron Phelps, recalled, "We had tried more dense paper cards for data storage, but the improvement was only a few times better. Punched paper tape offered no great advantage either. Magnetic tape had just come into its own in audio and offered the most promise." Even at the first working density of 100 characters per inch on a half-inch wide tape, a 10.5 inch diameter reel of tape could hold the equivalent of more than 35,000 punched cards. 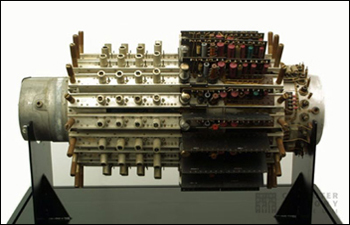 The first marketed tape drive from IBM, the 726 pictured to the left, operated at 7,500 characters per second - 56 times faster than the punch card rate. The 726 was announced as part of the 701 System and was delivered with the first system. The tapes for the machine were 1,200 feet long and had a capacity in excess of 2 million digits. The tapes had a magnetic surface on top of a plastic substrate which was very unusual at the time. IBM said a reel of tape replaced 12,500 punched cards. The IBM 702 (pictured to the left) was IBM's counter to the UNIVAC I, the first mainframe computer with tape drives. The 702 was aimed at business and government computing to compete with the UNIVAC I and therefore had less pure computational power than the 701. The US Social Security Administration had requested IBM to come up with a machine that could handle the task of storing and organizing extremely large volumes of data. In 1950 Social Security literally had acres of file cabinets of punched cards containing the Social Security records of every working American employee. The 702 was IBM's response to the UNIVAC I and the Government. 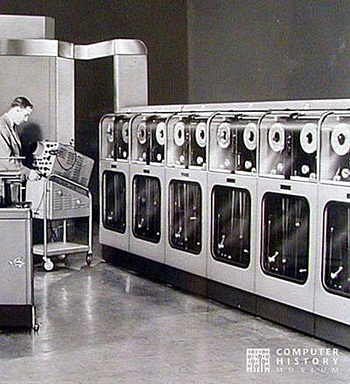 The first production model was installed internally at IBM in July 1955; ultimately fourteen 702s were installed. The 702 could do 3,950 additions or subtractions per second, but multiplication and division were significantly slower. Unlike the 701, which had a binary numerical system, the 702 used the decimal system used in the 603 and 604 electronic calculators. The central arithmetic and logic units were capable of performing more than 10 million operations per hour. As the 702 was designed for business data processing as opposed to scientific processing, the memory in the 702 was oriented toward storing characters instead of words. The system used electrostatic storage consisting of Williams tubes (same as the 701) for main memory. The main memory consisted of 2,000 to 10,000 characters of seven bits each. The fourteenth 702 was built using magnetic core memory. Williams tubes tended to become unreliable with age, and had to be "tuned" by hand. All the original 702 systems were eventually retrofitted with magnetic core memory. 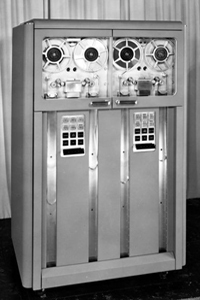 The IBM 727 Magnetic Tape Unit, pictured at the left, was announced for both the IBM 701 and IBM 702 in September, 1953. 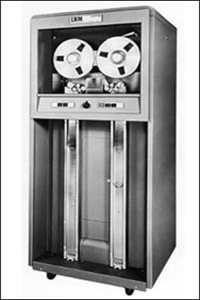 It was an upgrade from the 726 and became IBM's standard tape drive for their early computer systems in the 1950s. The density was increased from 100 to 200 characters per inch which increased the transfer rate from 7,500 to 15,000 characters per second. The tape speed remained the same at 75 inches per second. The tape width and length also remained one half inch and 1,200 feet. The IBM/3M magnetic tape format became the industry data storage standard of the late 1950s and continues to be used for long term storage even today. As the IBM tape system became the industry standard, it was much to the dismay of the UNIVAC organization who eventually had to comply with it. As part of the 702 System was the IBM 712, a high speed printer that was based on a new technology encompassing wire printing. The high speed printer was capable of outputting 1,000 lines per minute, which was more than six times the printing speed of previous units. The IBM sales and service organization provided extremely good maintenance and ongoing technical advice to their customers. This proved very difficult for the UNIVAC personnel to keep pace with. Eventually IBM came to dominate the business computer market during the late 1950s. 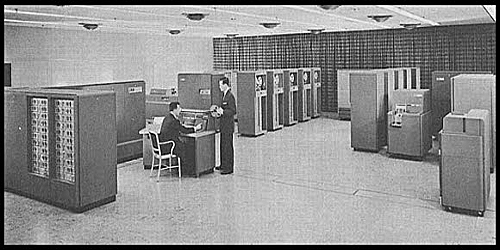 IBM introduced the 305 RAMAC (the name stands for Random Access Method of Accounting and Control) computer in September 1956, which was the first computer to include a hard disk drive - the IBM 350 Disk. Prior to this time, magnetic computer storage had consisted of core memory, tape, and drums. The magnetic disk was seen as a replacement for the magnetic drum. The RAMAC was one of the last IBM computer systems that was based on vacuum tube technology. The 305 RAMAC could deal with a variety of input sources, including punch cards, and could store and access unprecedented amounts of data with incredible speed. Perhaps more importantly, it was the first computer to offer "random" access to data whereas previously, storage tapes had to be run from start to finish to find the required information. Hard Disk Drives. The IBM 350 introduced the concept of instantly accessible information. Before RAMAC, information had to be entered by running a stack of cards through a punched card machine, and answers would arrive in hours or days. RAMAC could find data in seconds, alter it, and move on to find a completely different piece of data. It let enterprises think about data in new ways, mixing and matching it on the fly. Random access made the relational database possible. IBM leased the 350 Disk File for a $35,000 annual fee. The 350 Disk File consisted of a stack of fifty 24 inch discs, pictured to the left. It was 16 square feet, weighed over a ton, and had to be transported by plane. 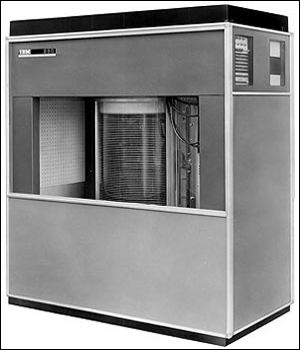 The RAMAC was the first commercial computer to use a moving head hard disk drive, storing five million characters of accounting data (the equivalent of 64,000 punched cards). The magnetic disks were accessed by two arms, controlled by vacuum-tubes, that were protected by compressed air. The 50 disks inside spun at 1200 revolutions per minute, while the arm dashed in and out, accessing the data at about 100,000 bits per second. To put it in today's terms, the colossal machine held about 5MB of data. This is about the same capacity as the first personal computer hard drives that appeared in the early 1980's, but was an enormous capacity for 1956. The Bendix G-15 computer was introduced in 1956 by the Bendix Corporation's Computer Division in Los Angeles, CA. The computer itself was about 5 feet by 3 feet by 3 feet and weighed about 1,000 pounds. A working model cost about $60,000 ($500,000 by today's standards). It could also be rented for about $1,500 per month. The G-15 was considered to be the first mini-computer. The machine's low acquisition and operating costs, and the fact that it did not require a dedicated operator, meant that organizations could allow individual users complete access to the machine. The G-15 was designed for the scientific and industrial markets, not for business data processing. The main memory was a magnetic drum. There was a high speed photoelectric paper tape reader, 250 characters (8 digits) per second plus a high speed paper tape punch. There were up to four tape drives using half-inch mylar magnetic tapes. A tape reel could store as many as 300,000 words (29 bits per word). The tape read/write rate was 430 characters (8 digits) per second with a bidirectional search speed of 2,500 characters per second. One of the primary output devices was the typewriter with an output speed of about 10 characters per second. The IBM 1401, first installed in late 1959, is considered to be the Model-T Ford of the computer industry because it was mass-produced and because of its sales volume. Over 12,000 units were produced and many were leased and resold after they were replaced with newer technology. Monthly rental for 1401 configurations started at US $2,500. IBM was shocked to receive 5,200 orders in just the first five weeks after the announcement – more than was predicted for the entire life of the machine! By late 1961, the 2,000 installed in the USA were about 25% of all electronic stored program computers by all manufacturers. The number of installed 1401s peaked over 10,000 in the mid-1960s. In all, by the mid-1960s nearly half of all computer systems in the world were 1401-type systems. The system was sold until February 1971. There were several keys to the popularity of the 1401 system. It was one of the first computers to run completely on transistors, not vacuum tubes, and that made it smaller and more durable. It was touted as the first affordable general purpose computer. It was also the easiest machine to program at the time. Grace Hopper’s compiler which lead to the popular COBAL language and John Backus’s FORTRAN programming language gave computer programmers new ways to instruct machines to do ever more clever and complex tasks. The 1401 could be operated as an independent system, in conjunction with IBM punched card equipment, or as auxiliary equipment to IBM 7000 series systems. It was the 1401 that transferred input data from slow peripherals to tape, and transferred output data from tape to the card punch, the IBM 1403 Printer, or other peripherals. This allowed the 7000 mainframe's throughput not to be limited by the speed of a card reader or printer. The more accessible 1401 Computer unleashed pent-up demand for data processing. More importantly, it marked a new generation of computing, causing business executives and government officials to think differently about computing. A computer did not have to be a monolithic machine for the elite. It could fit comfortably in a medium-size company or lab. In the world’s top corporations, different departments could have their own computers. 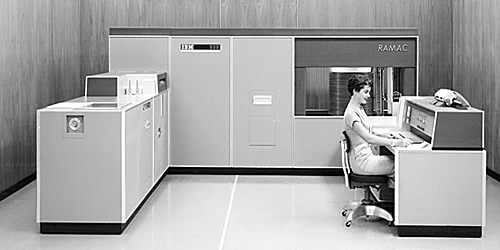 In late 1959 the solid-state IBM 7090 was the most powerful data processing system coming off IBM's production lines. The fully transistorized system had computing speeds six times faster than those of its vacuum-tube predecessor. 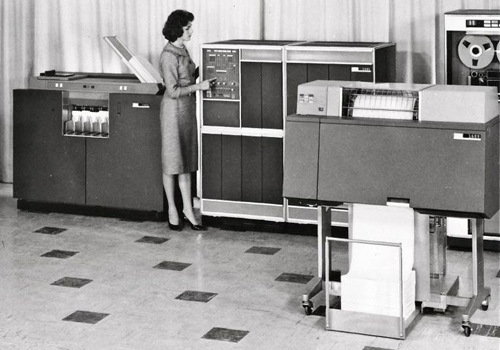 Although the IBM 7090 was a general purpose data processing system, it was designed with special attention to the needs of engineers and scientists, who found the demands for computation increasing rapidly. As a scientific computing system, the 7090 greatly sped up the design of missiles, jet engines, nuclear reactors and supersonic aircraft. The IBM 7090 processed large scale business applications such as inventory control, production control, forecasting and general accounting. The 7090 was well suited for IBM Tele-processing. In its most advanced form, Tele-processing utilized a powerful computer, the 7090, as the data processing center for a network of decentralized plant and office input stations. The six-fold increase in the 7090's speed resulted from the use of more than 50,000 transistors plus extremely fast magnetic core storage. The new system could simultaneously read and write electronically at the rate of 3 million bits of information a second when all eight data channels were in use. In 2.2 millionths of a second, it could locate and make ready for use any of 32,768 data or instruction numbers (each of 10 digits) in magnetic core storage. The 7090 could perform any of the following operations in one second: 229,000 additions or subtractions, 39,500 multiplications, or 32,700 divisions. Its IBSYS operating system was tape-based; it required 8 magnetic tape drives to run and had to be booted from the card reader. Designed for scientific research and large-scale technological application, 7090 computers were used in very advanced projects such as the Mercury and Gemini space flights. Another example were four IBM 7090 systems incorporated into the Air Force's Ballistic Missile Early Warning System, the 3,000-mile radar system in the far north designed to detect missiles fired at southern Canada or the United States from across the polar region (i.e. Russia). Another good example was SABRE, an automatic, centralized electronic airlines reservations system developed by IBM for American Airlines. SABRE used two 7090s for its computing nerve center. An upgraded version of the 7090, the IBM 7094, was first installed in September of 1962.